Times are tougher than they have been for the housing and mortgage markets. Rates are at 7 year highs, and home sales/prices are noticeably cooling. 2008's mortgage meltdown taught us to fear the worst at times like this, but there are some good reasons you probably shouldn't. Yes, housing is cooling and prices are no longer rising at unsustainable levels. There's the first piece of good news, actually! It would have been a concern to see prices continue to rise at more than double the pace of incomes. That was one of the ingredients leading up to the meltdown. 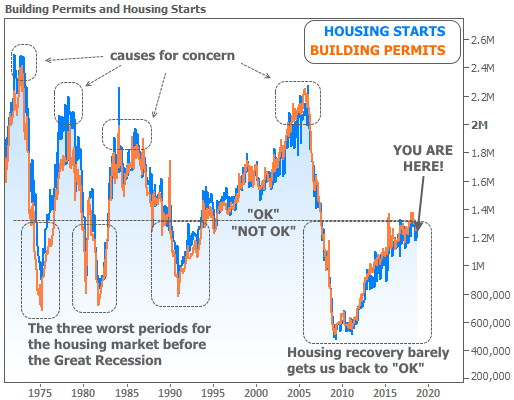 Another cause for concern leading up to the meltdown was the fact that home construction numbers (as measured by "housing starts" or building permits) were surging past previous peaks. 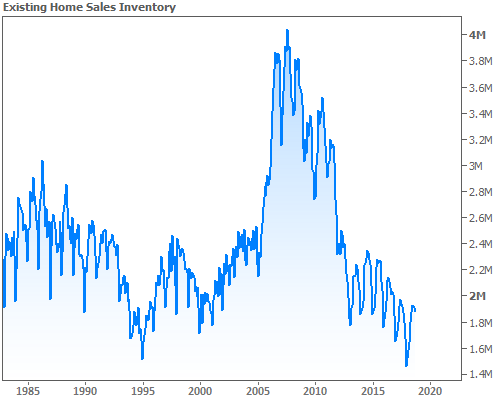 Those peaks can be seen in the following chart, as well as a line in the sand that separates the 3 worst periods for the housing market from everything else. Notably, our entire current housing recovery has taken place BELOW that line. The point is that housing may be cooling, but it was far from overheated. Another unsustainable trend in the housing market until just recently had been the unprecedented inventory draw-down. 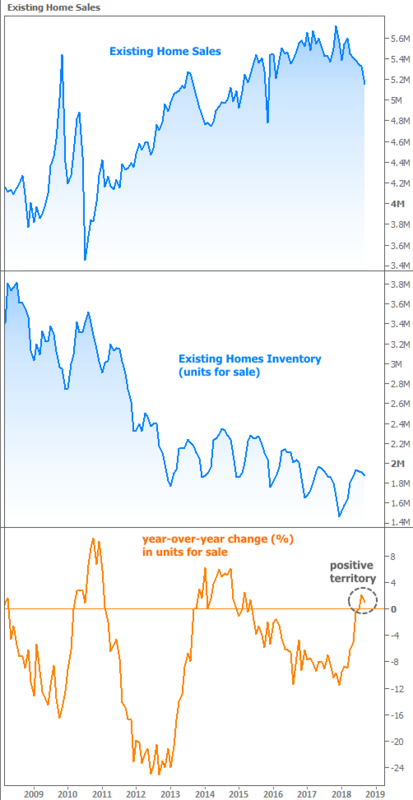 The following chart shows existing home sales, inventory levels (homes for sale), and the annual change in inventory. The bottom of the chart makes 2012 look alarming, but consider that orange line is dependent on inventory levels from 12 months prior. The crisis left us with a mountain of inventory to work through. 2012 was merely on the lower side of normal levels in terms of units, but its rate of change was extreme relative to the mountain. 2016-2017 was more of a concern because we were losing more and more inventory from levels that were already depressed. Even now, inventory remains low, but by moving back into positive territory, it's paving the way for a more active housing market, provided other factors fall into place. What are the other factors? Cases could be made for several (wages, student loans, geographical mobility, foreign investment balance), but no one could debate the importance of interest rates. Rates won't make or break a strong housing market, but as we clearly saw in 2013 and again in 2018, they can certainly make a dent. The toughest times are those when rates are spiking and homebuyers are waiting for the top. After rates stabilize, we tend to see activity start to pick up. That means the higher rates go, the closer we're getting to the starting line for the next leg up in housing. At present, daydreaming about a top in rates might seem fairly hopeless. Indeed, it could take months before it finally happens, but odds increase significantly in 2019. 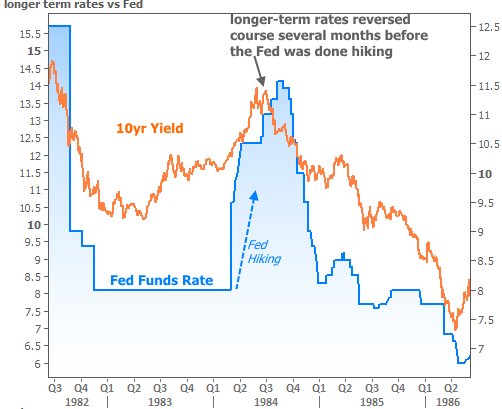 This has to do with the timing of the typical cycle in longer-term rates versus the Fed Funds Rate. The Fed controls overnight rates. Mortgages share most of their DNA with longer-term rates like 10yr Treasury yields. 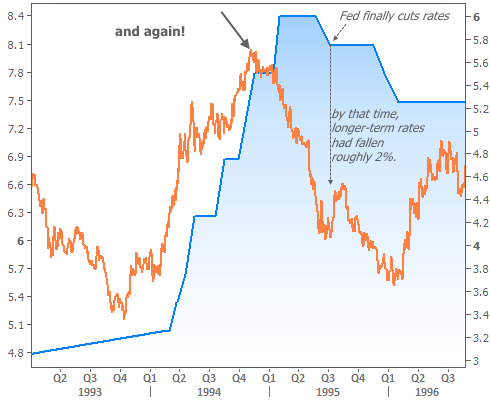 The charts below show every past example of a distinct Fed rate hike cycle (like the one we're in now) followed by the subsequent rate cut cycle going back to the 80's. 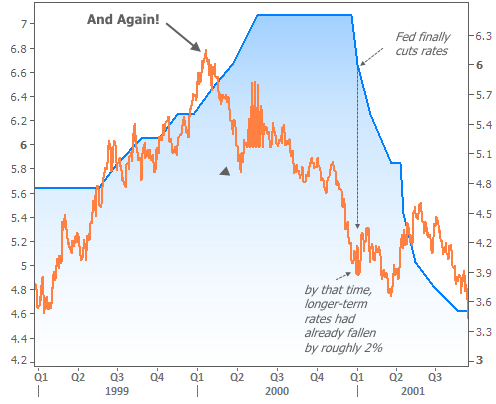 The blue line is the Fed Funds Rate (the Fed is beginning a rate cut cycle when the blue line moves lower for more than a few months). The orange line is the 10yr Treasury yield (a stand-in for mortgage rates in this case). So what's the point of all this? Simply put, the Fed will be the first to tell you that it will be close to the end of the current rate hike cycle by the middle of next year. 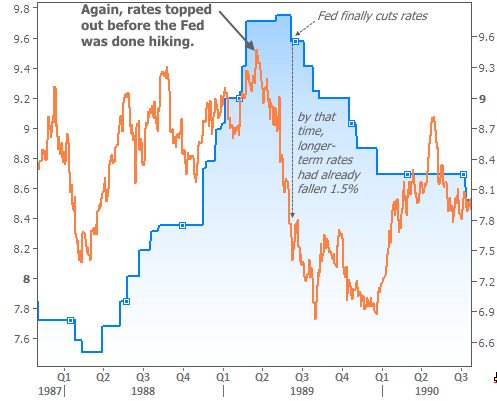 Unless the economy and inflation are just screaming higher, that means we'll have already seen longer-term rates top out, just as they did in every single past example in the charts above. Bottom line: I can't promise you that a big, friendly bounce in rates will happen at any specific time, but I can tell you it will eventually happen, and that we're getting close enough to talk about it. REAL ESTATE IN NEVADA is a boutique Realty Office that remains committed to the success of it's clients and Realtors. We are a Full Service Residential, Commercial and Business Opportunities Brokerage, that cultivates a professional and upbeat culture of Excellence, Integrity and Stellar Results! Real Estate In Nevada’s business model is built upon our values of providing experience, excellence and Integrity in all transactions. We strive to ensure that everything is done with total transparency. We build long-term relationships, and provide personalized effective guidance and support in all aspects of real estate transactions.